Holy Family is opening its doors Saturday afternoon and inviting parishioners to pray and reflect before the Blessed Sacrament, also known as the Eucharist, asking Jesus to bestow a blessing on the world. A special Mass for peace and and justice will follow. Pope Francis has proclaimed September 7 a churchwide day of prayer and fasting for peace in Syria. It was the first such proclamation since 2003, when Pope John Paul II called for fasting and prayer before the Iraq War, according to CNN Vatican analyst John Allen. “Humanity needs to see these gestures of peace and to hear words of hope and peace!,” Francis said. He called on the world’s 1.5 billion Catholics, other Christians, people of different faiths and “all men of good will” to join him in prayers and fasting. Many are. The Vatican expects to host huge crowds at its prayer vigil in St. Peter’s Square in Rome on Saturday evening. In a poignant conjunction, U.S. President Barack Obama on Friday declared September 6-8 to be National Days of Prayer and Remembrance of the 9/11 attacks. Obama encouraged Americans to remember the victims and their families through prayer, contemplation, vigils and other ceremonies. The Catholic day of prayer and fasting is the spiritual component of a wider push by Francis and other religious leaders to persuade the United States not to use military force in Syria, even as they acknowledge the severity of suffering there. According to the United Nations, more than 100,000 people have already died in Syria's bloody civil war, which has drawn fighters from Iran, Iraq and Lebanon. In a letter sent to Congress on Friday, a coalition of Muslim, Christian and Jewish leaders organized by the Washington-based Friends Committee on National Legislation urged legislators not to approve the use of military force in Syria. "Rather than yielding to the temptation to fuel the fire with more violence," the letter says, "we see an opportunity for the U.S. to leverage the full weight of its diplomatic influence and resources to advance a just, negotiated settlement." Sister Patricia Chappell, president of the Catholic peace group Pax Christi USA, signed that letter and said she's combining protests with prayers on Saturday. She’s fasting most of the day and joining a vigil at noon outside the White House with Catholic groups and other activists. But if she wants to transform others, she must first be transformed herself, Chappell said, a process aided by fasting. “It’s basically a way of cleansing myself and trying to be open to what God is directing me to say and do,” Chappell said. In addition to the political advocacy, Catholic parishes from Alaska to Washington are holding prayer services and fasting on Saturday. According to Catholic teaching, people who are fasting are allowed one full meal and two smaller meals. Ash Wednesday and Good Friday are obligatory fast days for Catholics ages 18 to 59, but the church occasionally asks members to fast on other momentous days as well. 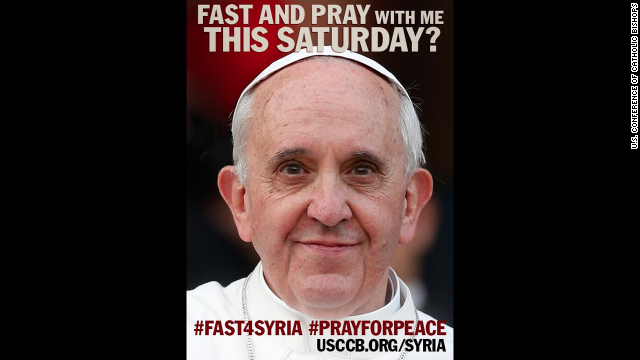 Catholics aren’t the only believers praying and fasting for Syrian peace this Saturday. The pope’s call to prayer and fasting is “too serious to ignore,” said Enuma Okoro, an author who has written several books about prayer. While granting the frailty of human faculties, human prayer has a quiet power, she said. “Such things have been known to topple kingdoms, to bring down walls, to free those held captive, to heal and comfort, and to do what appears impossible for our limited imaginations,” Okoro said. Even when prayer doesn’t move mountains (or mortar shells), it can still be worthwhile, said other Christians participating in Saturday’s spiritual campaign. Rachel Held Evans, a popular Christian author and blogger, said she’s weighed the theological and political options, wept over images of disfigured Syrian children, sent money to help refugees and listened to the counsel of wise people. But there’s a “strange power” in acknowledging helplessness before the divine and holding on to hope that God will answer, Evans said. The Gospels say that when Jesus saw suffering, his “heart went out to them.” But that’s a weak translation of the Greek, said Martin, a Jesuit priest and prolific author. What the Bible really means is that it was gut-wrenching for Jesus to see people in pain. “That’s how I feel when I look upon Syria,” Martin said. How do fasting and prayer help? Abstaining from food forms a physical connection between the person fasting and people half a world away whose stomachs growl because they can’t find a safe place to eat, said Martin. Fasting puts our bodies in need, just as others do involuntarily. As for prayer, Jesus famously said, “Ask and you shall receive.” Martin said he’s taking him up on that offer and asking for peace in Syria. Why not pressure the Arab League to police their own? Would do more than prayer and fasting combined. For starters, he could pick up the phone and ask to meet with them in person. The Arab League is made up of humans who actually exist. Anything is better than talking to yourself and skipping between meal snacks for a day. Which was that even if they laugh in his face, action is better than talking to yourself and thinking it helps somehow. The Pope prayed and fasted, and noe we have a political solution from Russia. Doen't this prove to everyone that God does exist? If only he had included the rest of the world instead of just one country we would all be in the land of puppy dogs and sunshine. How do you know he even did it? And if he did, how is skipping a couple of snacks and talking to yourself for a few minutes helpful? So these are the swine that Obama, McCain, Feinstein, and Graham want US to arm and be the Air Force for??? I'm not sure that link will work because I had to remove a letter because of the stupid auto filter on this site. At what point did the Saudis hijack this nation's leadership? I think that the president made a good decision, because the risk of bombing the stock pile of chemical weapons poses an immedate danger to civilian life at large. Once bombed the chemicals rises and spreds through the air posing a danger to civilian life and creating more problems..
Do you actually think Obamer cares about civilian lives? Oh you sweet, naive man. If only he did. If you're worried about that, then you will won't like ongoing Fukushima catastrophe which the msm continues to bury. Remember how the balloon bombs launched in Ja.pan in WW ll reached the US? Just checking in to see if peace has broken out in Syria. Nope, people still killing and dying. Looks like Pope-A-Dope's fasting and praying plan was a massive failure, or peace is not some unproven god's will. Off your knees christians and grab a beer and a hot dog. Hey, I didn't say grab a boy!! I didn't make any effort to pray or fast 'cause I'm very confident that neither would change anything. Almost a week of fierce praying and no real sign of peace. How long do the Chief Mumbo Jumbo Charlatan Shamans need to work their magic? Oops sorry about all of the repeat comments. It wasn't showing up and so I was trying to figure out what part was causing it. But all of the sudden they did show up. We have gone to war many times in the Middle East and it never seems to help.